I think the thing I like best about Meatless Monday is that it comes at just the right time. Monday evening is when some of us need a hearty helping of veggies to undo some of the weekend’s damage; indeed, I spent the bulk of mine throwing back rich dishes and cocktails in between naps. Today’s Meatless Monday dish is meaty in spite of itself. It’s filled with garlicky mushrooms, rosemary, leeks, and just enough red wine. It’s topped with potatoes whipped with eggs, cream, and olive oil. And then it’s baked until the potatoes are golden and the mushroom sauce has bubbled up around the sides. Use a variety of mushrooms, if possible; I used regular white mushrooms, a couple of fat portabellas, and a few oyster mushrooms, but feel free to use whatever’s available to you. Be sure to scrape the gills from the portabellas before cooking (if using), and chop these into cubes. It’s rich and satisfying, fragrant and delicious; it’s the sort of thing you could serve to a ravenous meat-eater and he wouldn’t know there wasn’t a spot of beef in it. Even the cat was interested, and she won’t give a sniff to anything that isn’t 95% protein. Boil potatoes in a large pot of water until tender, 15 to 20 minutes. Drain and mash until almost no chunky bits remain, then whip in parmesan cheese, two tablespoons of olive oil, 1/4 cup of cream, and two eggs. Taste and add salt as needed; I chose not to add salt, as the parmesan lent sufficient seasoning. Set aside. Meanwhile, heat the remaining oil and the butter over medium-high heat until butter begins to bubble and foam. Stir in shallots and garlic, sautéeing for two minutes until translucent. Add leeks, and saute until shallots have melted down and no longer hold their round shape, about three minutes. Meanwhile, again, chop mushrooms. 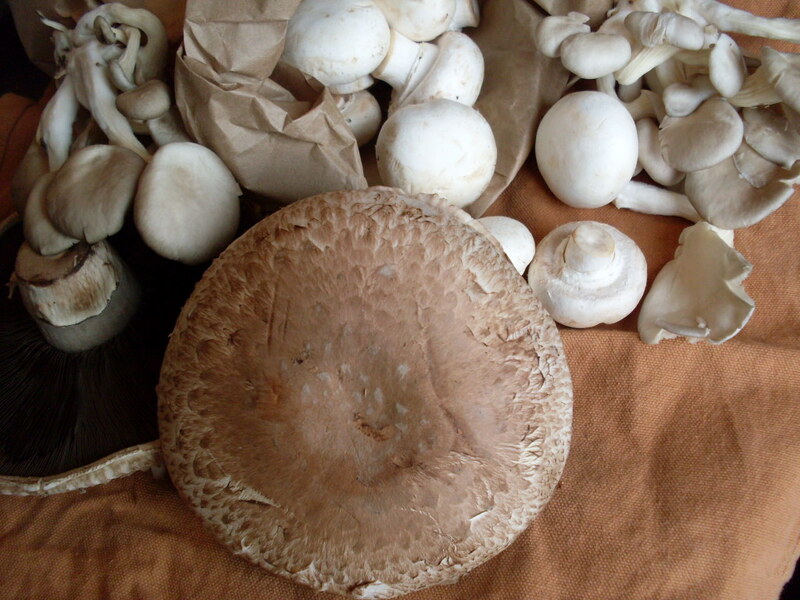 It is not necessary that the mushrooms be of uniform size; different sizes will allow the mushrooms to achieve varying textures, which is ideal. Add mushrooms and rosemary to pan, stirring to coat in fat. Allow to sweat, but do not salt the mushrooms. It will take about five minutes, with occasional stirring, but the mushrooms will release their liquid and it will be awesome. Once mushrooms have sweat and wilted, about five minutes, sprinkle flour over top of the mushrooms and mix until flour disappears. Add wine, soy sauce, mustard, Worcestershire sauce, pepper, and nutmeg. Reduce heat to medium and allow to thicken slightly, two to three more minutes. Stir in parsley and cream, and taste, adjusting seasonings as needed. 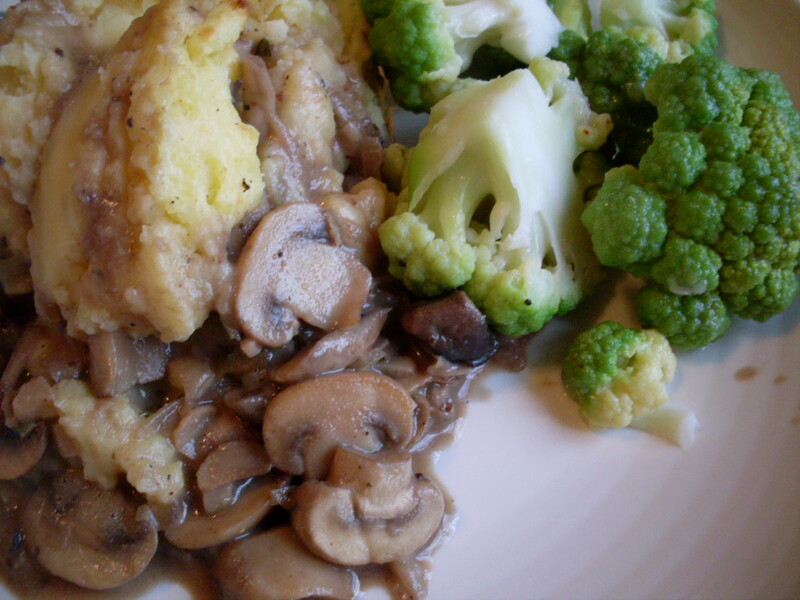 Remove mushrooms from heat and pour into a 1 1/2- to 2-quart casserole dish. 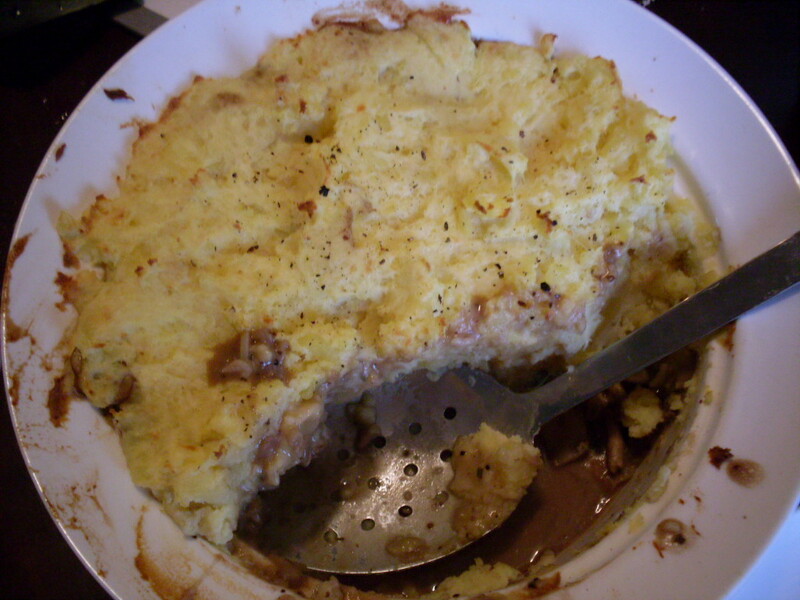 Top with mashed potato mixture, spreading to cover completely. Place in oven and cook for 20 to 25 minutes, until potatoes are golden on top and mushroom sauce is bubbling out from around the sides. Serve hot from the oven. If you have leftovers, this dish is even better the second day, when the flavours, especially the rosemary, garlic, and pepper steep and meld together. Nick can’t wait for lunch tomorrow, and I am looking forward to the smell of this scenting my office. Yum! PS – check out my recipe for Huevos Rancheros on the Meatless Monday website! < Previous Get yogurt, make cheese. Next > Garden report: We have so much chard, and the threat of too many cucumbers. I am SO EXCITED to try this… yum!!! I bet this is very tasty! However, I’ll have to wait till Autumn or Winter in the northern hemi b/c it’s just too hot right now to heat the oven. In a completely ridiculous bid for domestic harmony during a month of utter chaos, I started making this at 4:45 p.m. yesterday when I had to leave the apartment for work an hour later. It was silly of me, but did it ever smell good. I basically threw it in the oven and ran away while Rob kept watch, and later ate it, and drank most of a bottle of red wine. Hours later after midnight, I came home to him in bed, the dishes done, and, having not had dinner, proceeded to warm up the first piece. Thanks for sharing! Leftovers for breakfast this morning, magnifique. Hi Jackie – thanks! I am so glad you liked it! I think the name of the thing should be changed to Mushroom Cavalcade of Joy (all caps? ), because it made me laugh out loud. Wait … he did dishes? I am going to remind Nick that he is not quite pulling his weight. He always really appreciates that. Agreed – green beans would be awesome. I kind of think something decadent like creamed spinach would be good too, though it would be hard to justify. Good side vegetable: green beans. And I think I might add veggie ground round next time for protein. I just cooked this tonight and it turned out GREAT! I’m definitely going to make it again some time. I did sprinkle some cheese on top of the potatoes before putting them in the oven just to add a nice crunchy cheese layer of additional flavor. Next time I also might try some peas and carrots in between the mushroom layer and the potato layer. Thanks for the recipe. Extra cheese always makes everything better – good call. Thanks for trying the recipe, and for letting me know how it went! I’m glad you liked it!